The arrival of Winter migrants into the area is always more emphatic than the overnight appearence of small numbers of Warblers, or the daytime trickle of Hirundines so frequently the feature of Spring migration. As is the case with Spring migration, this is primarily due to a dependence upon the correct weather conditions over the continent (in particular Scandinavia) and the North Sea for migration from source of origin to over-wintering site. The onset of reasonably calm weather will induce these migrants into making the North Sea crossing during the night and arriving early morning over the UK's east coast, then continuing inland. Such conditions being relatively uncommon, encourages thousands of birds to make the crossing simultaneously and often makes for the highlight of the visible migration calendar. After the usual early arrivals from late September and early October, very often the highlight of the whole visible migration calendar, involves the sometimes spectacular arrival of occasionally thousands of Redwing, Fieldfare and Starling. It's not unusual for all three species to arrive "en masse" one particular morning. Occasionally, these movements can be augmented by good numbers of Brambling, but the numbers of Brambling involved here, have been very disappointing so far, and from my own observations around the county since the early 1990's, it seems that good Brambling movements occur about once every five or six years. Starling are often the most exciting species to watch moving through. Flocks can be enormous, sometimes stretching almost as far as the eye can see in a broad band. Quite often these flocks are low and are often best picked up in advance by scanning the low eastern horizon. The return migration of Winter migrants can occur over the space of several weeks. Large scale movements are relatively rare here and migration is often reduced to a daily trickle. Despite the large Autumn arrivals of Fieldfare, Redwing and Starling, usually low numbers of these birds are recorded migrating during the day. In early 2007, large groups of Fieldfare were seen to leave the area, gain height and fly off high into the darkening evening sky at the start of their return migration. This was the first time that I had seen this and went some way to perhaps explain why daylight counts were so low in comparison to those of the preceding Autumn. Of Brambling, Siskin and Redpoll, none regularly occur here in the Winter and counts rarely achieve more than single figures. Limited suitable feeding habitat, has so far rendered the three mentioned finches to the status of casual visitors. Away from their September-November migration periods, records consist of wandering lone individuals or very small groups. Large numbers of Starling and Fieldfare however, can build up at certain sites in the area, this mostly just prior to their return migration. The most favoured of these being the pastures around Tug Bridge Farm and the Penny Pasture Common/Park Farm areas. Substantial three-figure flocks have built up here most years from March-April, but flocks frequently wander the area in search of suitable feeding. One of the largest Fieldfare build-ups, was in March-April 2001, when counts rose from 400+ March 17th, to 800 by March 31st. These were augmented by further arrivals and on April 2-3rd, the flock reached a maximum of 1,200 birds. 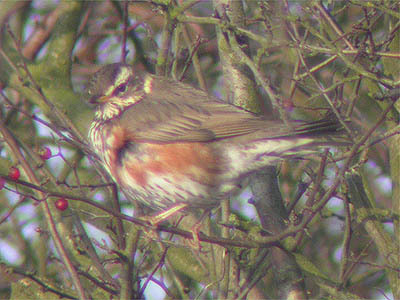 Two days later, and after a mass overnight departure, the remaining Fieldfare totalled just a mere 28. The largest Starling count was 700 in the Leyfields area in mid-March 2002.